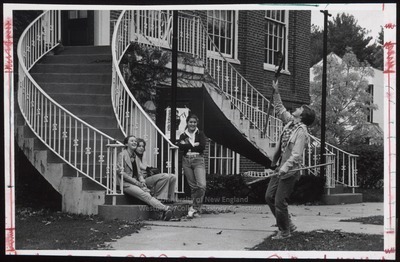 A male Lacrosse player demonstrates his technique to three Westbrook College students in front of Proctor Hall in this 1970s black and white photo by Ellis Herwig Photography of Cambridge, MA. Two of the three young women sit on the Proctor Hall steps while the third leans, arms crossed, on the stair railing.The Lacrosse player holds a Lacrosse stick in each hand. He has just caught the ball in his right stick. The young women wear jeans and bell bottom pants with casual button-down collar shirts and light-weight jackets. The male student wears corduroy pants, a plaid shirt and a denim jean jacket.